CINCINNATI, Ohio—On Friday, September 21, from 6 to 8 p.m., the Cincinnati Arts Association’s Alice F. and Harris K. Weston Art Gallery in the Aronoff Center for the Arts kicks off its 2018-19 exhibition season with two new photography exhibitions organized and presented by FotoFocus and curated by Carissa Barnard, FotoFocus Deputy Director of Exhibitions and Programming. 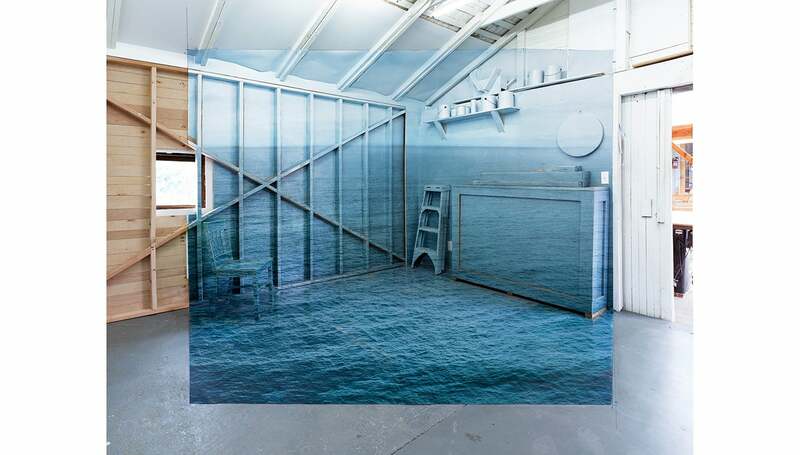 Prospect and Refuge is an evocative installation with an accompanying selection of photographic spatial manipulations by Chris Engman (Los Angeles, CA) that combines photography and constructed artifice. Wide Angle: Photography Out of Bounds presents an impressive selection of regional, national, and international artists who engage with photographic imagery through collage and alternative processes. Chris Engman: Prospect and Refuge features Containment, a new site-specific work created expressly for the FotoFocus Biennial 2018, which gives viewers a first-time glimpse into Engman’s manufactured “architectural landscape” process in physical form. This constructed environment, housed in the Weston’s street-level exhibition space, fuses the tangible and surreal, playing with preconceived notions and expectations about space, memory, and the function of photographs as records of truth. Prospect and Refuge continues in the East Gallery with a body of work exploring the relationship between illusion and materiality. Through Engman’s laborious process of careful documentation and detailed recreation, the artist asks the viewer to consider how we understand photographs and how we experience the world. Chris Engman lives and works in Los Angeles, CA. He earned a master of fine arts from the University of Southern California Roski School of Fine Arts (Los Angeles, CA) in 2013, and a bachelor of fine arts from the University of Washington (Seattle, WA) in 2003. He has exhibited widely in the United States and Europe including at the Henry Art Gallery – University of Washington, Seattle, WA (2007); the Seattle Art Museum, Seattle, WA (2007); Institute for Contemporary Art in San Jose, CA (2013); Museum of Photographic Arts in San Diego, CA (2013); Clair Gallerie in Munich, GER (2012); 68 Projects in Berlin, GER (2015); Project B in Milan, ITA (2012); and Flowers Gallery in London, UK (2012). His work is featured in numerous public and private collections including the Henry Gallery – Univ. of Washington; Seattle Art Museum; Museum of Fine Arts Houston; Orange County Museum of Art (Newport Beach, CA); Covington Library (Seattle, WA); Microsoft Art Collection (North America); and the Elton John Collection. Engman is represented by Luis De Jesus Los Angeles and in Seattle by Greg Kucera Gallery.